The Google ecosystem has a lot to do with it. Amazon may have pioneered the smart-speaker movement, but Google isn't far behind. A year after Amazon debuted the first Echo, Google followed in its footsteps with the Home. The company copied Amazon yet again with the Home Mini, which is its version of the Echo Dot. Last year, Amazon revealed the Echo Show -- a smart speaker with a display. And, sure enough, earlier this year, Google announced that it, too, was getting into the smart-display category. Lenovo's Google-powered Smart Display is a worthy Amazon Echo Show rival. Not only does it sport a stylish design along with a stunning display and superb speakers, it's also a great showcase for all of the extra functionality and features that Google brings to the table. Be the first to review the Smart Display? This time, Google isn't making the hardware itself -- at least not yet. Much like its Android ecosystem, the company is partnering with several hardware manufacturers to release a line of different Google-powered smart displays. The first to do so is Lenovo with its Smart Display, and it sets the bar high. Priced at $200 for the 8-inch model and $250 for the 10-inch, it's stylish, the display is stunning and the audio quality is stellar. 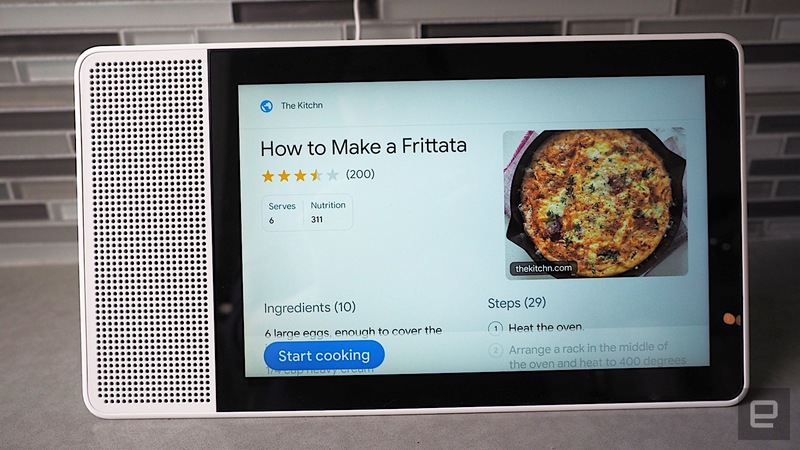 After several days with it, I can safely say that Lenovo's Smart Display -- and Google's line of smart displays in general -- pose a bona fide threat to Amazon's Echo line. As much as we liked Amazon's Echo Show, we weren't fond of its design. 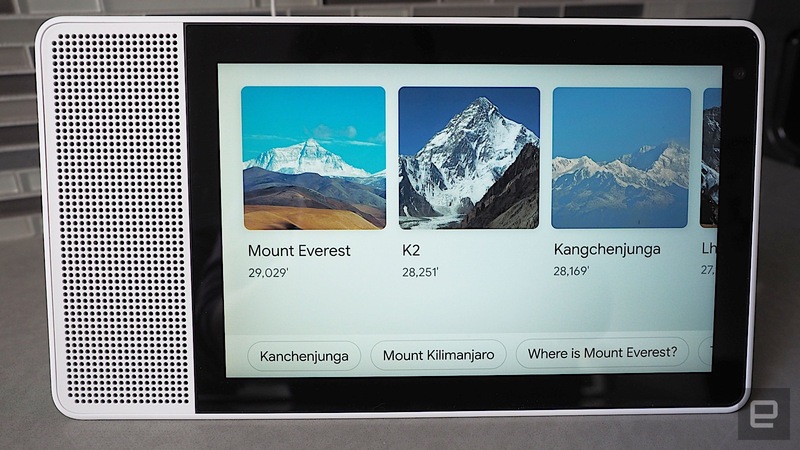 The Lenovo Smart Display, on the other hand, is a thing of beauty. 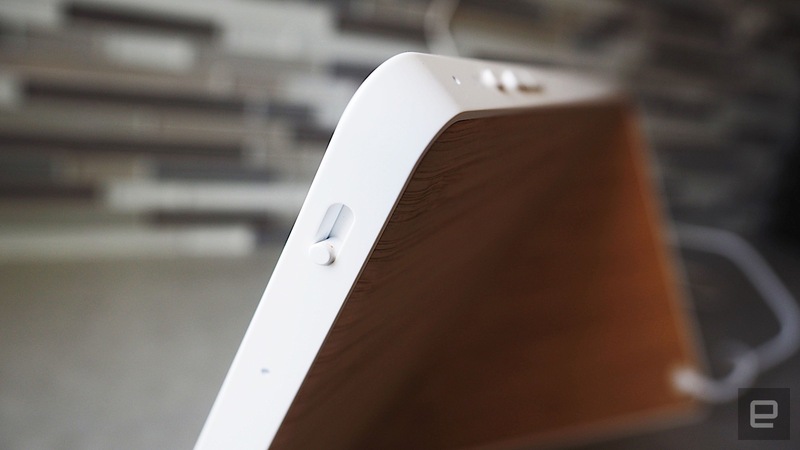 Clad in a white shell, it looks like a fancy tablet stand, with a large HD IPS touchscreen dominating the front and a slim speaker on the left. The back has a curved triangular hump, which props up the display horizontally or vertically -- the latter is primarily for video calls. When not making video calls, a physical cover can slide over the lens -- which is great for those concerned about privacy. The Echo Show, on the other hand, disables the camera and mic with one button -- which effectively renders it useless if you want to block the camera. Setting up the Smart Display is simple, but you'll need the Google Home app installed first. As soon as I fired it up, the app detected the hardware immediately. After I set up its WiFi and connected it to my Google account, it detected my Google-connected services and hardware automatically; Google Music was available instantly, and I could view any Nest cams I had around the house. Saying "Show me the front door," for example, pulled up a view from my Nest Hello camera. You can also connect the Smart Display to other services, like Spotify or Pandora, or third-party smart home products like the Philips HUE lights. I will warn, however, that setup is faster on Android than it is on iOS. With Android, I didn't need to enter the WiFi password because it was synced automatically. I also found it much more difficult to verify my Duo phone number for video calls via iOS -- I had to download a separate Duo app to get an account in the first place, and then when I tried to link the Duo account with the Google Home app, the verification wouldn't go through. Lenovo and Google told me that they've since fixed the issue with an update, but it wasn't working while I was testing it. There are some differences between the two models beyond their sizes. The 8-inch version has a gray rear, while the 10-inch one comes with a stylish bamboo finish. Both have HD displays, but they come in slightly different resolutions -- the 8-inch is 1,200 x 800, and the 10-inch is FHD (1,920 x 1,200). Unsurprisingly, the 10-inch version takes up more space, making it less suitable for smaller kitchens or living rooms. If you're planning on using the Smart Display to watch a lot of YouTube videos (which we'll get to later), then that larger screen is well worth it. Speaking of which, that display is simply gorgeous. It pops with rich, saturated color, and it's crisp and sharp, to boot. Watching YouTube videos on it is an absolute treat, and it makes a great digital photo frame (when you hook it up to your Google Photos library). I was pleasantly surprised with the audio too. No, it doesn't have the deep bass of, say, a Sonos One, but the 10-watt speaker has a bold sound with rounded, punchy notes. The default home screen has the local weather forecast and my calendar appointments. But, thanks in part to Google's deep well of apps and services, the touchscreen on a Google smart display is that much more useful. Google Maps, for example, is one of my favorite features. When I asked "Show me the way to the Golden Gate Bridge," it brought up the map along with traffic conditions and even sent the directions to my phone (without me having to ask). Searching the web is a better experience on a Google-powered smart display than on an Echo, too. When I asked "What is the tallest mountain in the world?" it listed results in a visually rich way complete with thumbnail photos of the top 10 mountains. Underneath those results are suggestions for follow-up queries, like "How tall is Mount Everest?" or "How tall is K2?" One particularly great feature is how it displays recipes. I searched for "chicken noodle soup," and it listed results from a variety of websites like TheKitchn and the Food Network. After choosing a recipe, I could then say "Start cooking" or hit the equivalent button on the screen. The Assistant will then read the ingredients to me complete with a visual guide and then give step-by-step directions. You can say "Hey Google, next step" to proceed through the recipe as well. As part of the Google Home app, the Smart Display has a Routines feature, which lets you say a key phrase to trigger a series of actions. Saying "good morning," for example, could prompt it to tell you the weather, traffic of your commute and your day's appointments, all in succession. And, of course, you can use it to set timers, alarms and reminders. 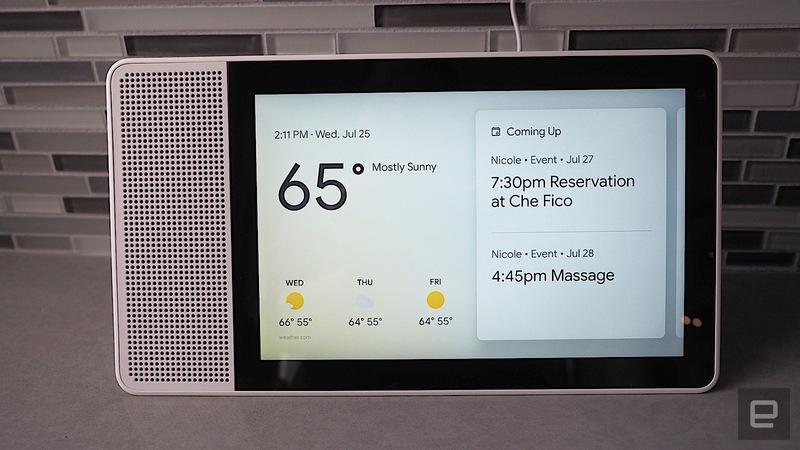 Fortunately, you can add multiple Google accounts to the Smart Display, and thanks to Google Home's Voice Match feature, you don't have to worry about accidentally looking up your roommate's calendar appointments and vice versa. I didn't have much of an issue with this as I only used my own account, but I can see how it would be beneficial with multi-person households. This doesn't work so well if you're trying to merge home and work calendars of the same person, since, well, you'll have the same voice. I tried to add my work calendar to the Smart Display, for example, and it was just a mess because it kept confusing the two different accounts. That said, the Smart Display doesn't work with GSuite just yet, so adding a work-related account is probably fruitless anyway. At this point, it's important to realize that the Smart Display is mostly just a smart speaker with a touchscreen; you can't interact with it in the same way you would a tablet. Instead of running Android, all Google smart displays run on the Android Things OS. You're essentially getting a Google Assistant interface, with no need to install any apps. Therefore, interacting with the Smart Display is primarily voice-driven. You can swipe and tap the screen to interact with the video player or go through different search results, but you can't bring up a list of apps like on a tablet. Instead of tapping around to find the Spotify app, for example, I had to say a command like "Play Discover Weekly on Spotify" in order to trigger the player. As I mentioned earlier, perhaps the biggest highlight of Google's smart displays is the inclusion of YouTube. Amazon's Echo Show used to have it, but it has since disappeared. YouTube is essentially a Google-exclusive when it comes to smart displays. That even includes YouTube TV. Say "Show me ESPN on YouTube TV," for example, and if you're a subscriber, you can watch the channel live. Combine that with the Lenovo's incredible display and solid audio, and you have a compelling mini entertainment center. The problem is, the lack of a proper menu limits the Smart Display's functionality. For example, you aren't getting the full YouTube app, which means no access to subscriptions or your playlists. Instead, you have to be very specific in your queries. I had to say "Show me the latest Engadget episode on YouTube" even though I'm already a subscriber to the channel. The same goes for YouTube TV; I couldn't look up a list of channels and select one. I had to go to a channel directly every time. There are limitations with search as well. For example, I couldn't search for a specific recipe from a specific site. I wanted to look up a soy-milk recipe from ChefSteps, and it insisted on giving me soy-milk-recipe results from five other sites instead, presumably because these were the sites that collaborated with Google to have Assistant-friendly recipes. There were times when I wanted the Smart Display to have a proper web browser, too. For example, I wanted to search for facts on "Bovril," a British-made concentrated beef-extract paste, but it kept thinking I was saying "borrow" or "Barbara" instead. I was dying to just type in "Bovril" on the screen, but I couldn't because there's no onscreen keyboard. And there's the rub: The Lenovo Smart Display sits somewhere in between a smart speaker and a tablet. It's much more functional than a speaker thanks to the touchscreen -- and more useful than rival Amazon products due to the Google factor -- but it's also not quite as functional as a tablet. Of course, a tablet has more of a touch interface rather than a voice control one, so that's a tradeoff as well. 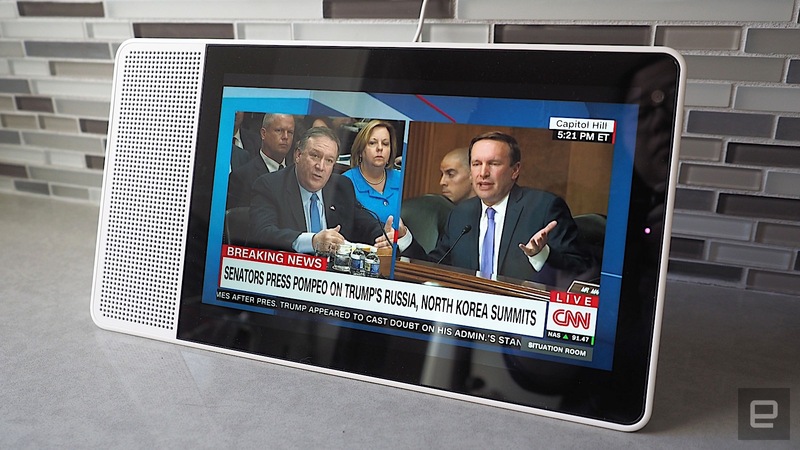 In the end, however, I think Lenovo's Smart Display is a wonderful example of what a smart display should be. Its HD touchscreen combined with booming speakers and all of those Google Assistant smarts make it a worthy Amazon Echo Show rival, despite a few flaws. 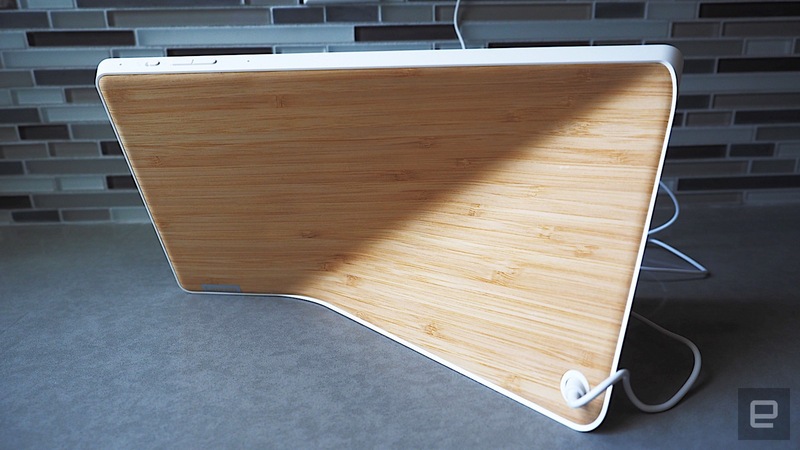 It works as a mini entertainment center, a kitchen helper -- you can even use it to make video calls. Sure, it's not perfect -- it would be nice to play YouTube playlists and have more-robust touchscreen features -- but the benefits far outweigh downsides.